Tourism figures for Catalonia continue to break records despite the economic crisis. 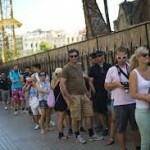 During the first seven months of this year, 8.4 million foreign tourists visited Catalonia. 2,026,725 foreigners visited Catalonia, which represents an increase of 9% over the same month last year. Catalonia has therefore consolidated its position as the most visited tourist destination in Spain, with British, French and German tourists making up the majority of visitors. Following Catalonia, which received 26.3% of the total number of tourists, there is the Balearic Islands, which received 1.9 million tourists, 25.7% of the total.